Scotland celebrate Sean Maitland's try at the weekend. NO DISCIPLINARY ACTION will be brought against Scotland or England after a review of the tunnel incident which preceded the Six Nations clash last weekend concluded there was no clear evidence of violent conduct. Television footage appeared to show England back Owen Farrell and Scotland forward Ryan Wilson embroiled in some pushing and shoving before fellow players separated the pair ahead of Saturday’s game at Murrayfield. In a statement released this afternoon, Six Nations Rugby said it will write to both unions ‘to remind them and their respective players of their obligations to uphold the reputation of the tournament at all times’ but no further disciplinary action will be taken. 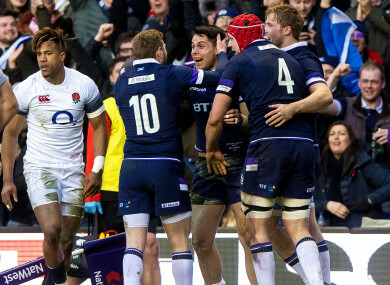 Scotland went on to win 25-13, recording a first victory over their near neighbours in a decade and in the process ending England’s Grand Slam and Triple Crown aspirations. “Six Nations Rugby has concluded its investigation into an incident that allegedly took place before the senior men’s international match between Scotland and England at BT Murrayfield in the 2018 Natwest Six Nations Championship on Saturday, 24 February 2018,” the statement read in full. “It had been reported that some of the players had been involved in a ‘melee’ or ‘scuffle’ in or near the tunnel after the pre-match warm-up. Email “No punishment for Scotland or England over Murrayfield tunnel incident ”. Feedback on “No punishment for Scotland or England over Murrayfield tunnel incident ”.